Hey everybody and happy Sunday! It has been so long since I've played along with a challenge blog and this week's challenge over at #GDP096 was just too good to pass up! 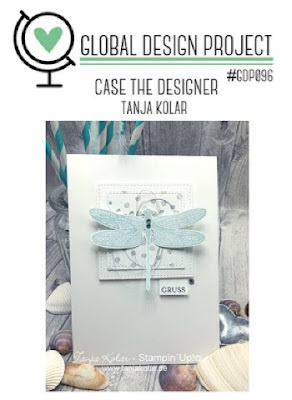 This week the Global Design Project is CASEing its' very own Tanja Kolar and check out this gorgeous card that we get to use as inspiration. When you CASE a card you can take anything from it that you want and use it in your own card. I chose to use Tanja's layout. I switched the squares out for circles and added a larger sentiment. I love that two cards using the same layout can look so very different. My sentiment is from the Window Shopping stamp set. The little "To You" on the hand-cut banner is from the Tabs For Everything set. I really had fun layering all of these beautiful pieces. The flower is put together from two pieces from the Eclectic Layers Thinlits. The tiny leaves were watercolored using Lemon Lime Twist and Emerald Envy and then cut using the same framelits as the flower. I hand cut both the sentiment piece in Berry Burst and the little banner in Pool Party. The circle was cut using my stitched circle framelits and the Gold Foil Doily, Gold Metallic Thread, Pick a Pattern Washi Tape and Metallic Sequins were the perfect finishing touches for this card. I'm so glad I had a chance to play along with #GDP096 this week! 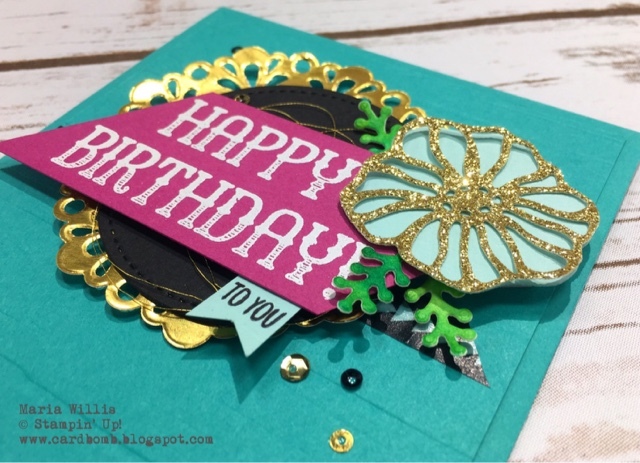 If you're looking to see more amazing projects using Tanja's card as inspiration head on over to the Global Design Project Blog and check out all of the amazing cards over there. Happy Sunday and Thanks for stopping by today! As always, please let me know if you have any questions or are interested in purchasing products to make some cards of your own. I've got a full list of products below so feel free to click on through to my store if you're interested. BONUS: This month we've got a great deal going on and for every $50 that you spend in July you will receive a coupon for $5 to spend in August! 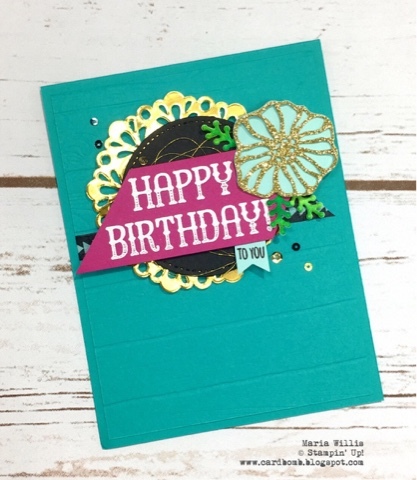 Maria, I agree with Carolynn...great use of color and texture on this card. Thanks for playing along with Global Design Project.